Knot Theory: Why Everything Tangles : The Bryant Park Project Knot theory: Science for people putting away the Christmas lights. Post-Christmas, actually. Time for all that glitters, sparkles, blinks and sings or dances at the flip of a switch, to be packed away until next year. Time to wonder just how it is that Christmas lights to tie themselves in knots no matter how hard you try to outsmart them. Each year, you open the box to find a tangled mess, right? And after each Christmas, possessed with renewed determination, you scheme to store them more carefully this year, convinced you have finally come up with a fool-proof system. So maybe you roll each strand in a loop around your elbow and then lay it carefully in a box, or you return each rolled strand to its original box, or perhaps you wrap each one in tissue paper, secure them all with a rubber band, twist tie, or God forbid, even a scrunchy. 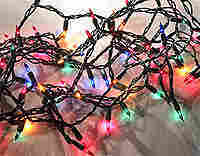 Then next Christmas rolls around, and you retrieve the box full of lights only to open them and discover a twisted, tangled mess, taunting you. You can stop blaming yourself for this frustrating phenomenon as researchers at the University of San Diego have recently concluded that it's a mathematical and physical certainty. Blame the universe instead! There are a couple reasons for this argument. The first being the Second Law of Thermodynamics (Code name: Entropy). Order tends toward disorder, and your carefully packed strands obey by doing their part. The second and more complicated reason is explained in great detail by UCSD physicists Douglas Smith and Dorian Raymer in their Oct. 16 paper: "Spontaneous Knotting of an Agitated String." Basically, mathematicians have studied knots forever and developed all sorts of theories and classifications of their variations, but physicists have only recently began to explore what equations govern their formation. To look into this, Smith and Raymer built a very simple experimental apparatus consisting of a clear plastic box and a motor. They put one piece of string in the box at a time and spun it around and around, then took it out and documented its final state -- knotted or not. They did this 3,415 times, varying the length of string, rotation speed, number of rotations and size of the box. Why 3,415 times, you may ask? I quote: "The scientific answer is that 3,415 was around the point where we had statistically compelling results," Smith writes. "The human answer is that 3,415 times was about as much as we could stand." "Jones polynomial" for each resulting knot, a mathematical property based on parameters such as the number of string crossings. So think about the length of your Christmas tree lights (undoubtedly more than 18.124 inches), how much space they have to move around in their storage boxes (a fair amount I would presume), and how often they might be jostled when moved to and from their yearly resting place (not exactly a smooth ride up those attic stairs). In all likelihood, a knot has formed while the box is till in your hands. Although I guess you could still blame yourself. Bonus: An in-depth writeup of this labyrinthine marvel here, with thrill-a-minute video of the spinning knot box. This blog is no longer active. You can find a list of current NPR blogs at npr.org/blogs. The Bryant Park Project started as a blog in the summer of 2007 and ended as a radio show and online community in July 2008. Want to know more? Read our frequently asked questions.